Executions in Saudi Arabia on the rise. Nearly half of the executed foreign nationals. Foreigners 8 times more likely to be executed for the same crime. Saudi Arabia has executed at least 175 people over the last 12 months, on average one person every two days, according to a report released on Tuesday by Amnesty International. The report said at least 102 people had been put to death in the first six months of 2015, compared with 90 across the whole of 2014. Saudi courts allow for people to be executed for adultery, apostasy and witchcraft. People can also be executed for crimes committed when they were below 18 years of age. In May this year, Saudi Arabia advertised for eight new executioners to cope with an increasing number of death sentences. The role, posted on the civil service jobs portal, was described as “executing a judgment of death” as well as performing amputations on those convicted of lesser offences. Although foreigners make up just one quarter of the oil rich state’s population, Amnesty reported they made up the majority of all those sent to death row. Its report revealed that at least 1,695 executions were carried out between 1985 and May 2008, with the number of non-nationals totalling 830, compared with 809 local citizens. It was impossible to ascertain the nationality of the remaining 56. But it is in the number of reprieves that the greatest disparity lies. Amnesty claimed that a pardon is granted in one in every four capital cases involving a Saudi citizen but only one in 30 of each foreign case. Many of those foreigners lacked the Arabic skills to understand court proceedings and charges. The photo of the three-year-old Syrian boy, Aylan Kurdi, dead, face down on a Turkish beach, will be remembered not just for its emotional impact, but because once and for all it revealed the grotesque and deadly motives of those who press for, and profit from, the never-ending expansion of Western war-making in the Middle East. In a triumph of opportunistic cynicism over truth, restraint, or good taste, they quickly blamed Kurdi’s death on the failure of the US and European governments to depose Syria’s president, Bashar al-Assad (“Abusing Dead Syrian Children,” by Daniel McAdams, SLL, 9/4/15). 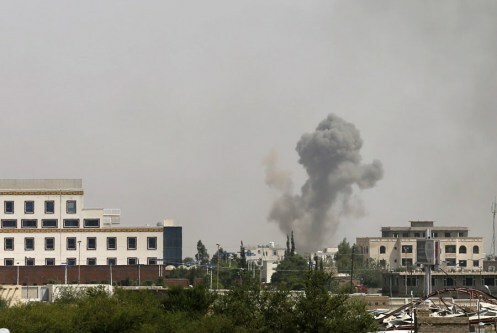 Smoke billows from the site of a Saudi-led air strike on al-Dailami air base in Yemen’s capital Sanaa September 6, 2015. Al-Qaeda is back. This time around it brought with it another religious aberration: ISIS. With Yemen fast becoming an incubus for all things radical, Riyadh insists the real enemy is the Resistance. The trick here is to discern the terrorist from the freedom fighter. With Saudi Arabia and the GCC countries busy engineering the annihilation of Yemen by way of ground invasion and air raids we almost forgot that behind the towering shadow of the oil kingdom, radicalism’s legions are standing by, awaiting for opportunity to knock.